improving the quality of the workforce, increasing economic self-sufficiency, reducing welfare dependency, meeting employer skill requirements, and enhancing the nation’s productivity and competitiveness. increased branding and awareness to ensure that all those in need of the Board’s services are informed and empowered to access the services they need and to establish and maintain the Board’s influence as strategic leader of the region’s workforce development system. View the draft Two-Year Plan Modification of the 2017–2020 Strategic Plan. Public comments must be submitted in writing to erin.rea@spworkforce.org or 1301 Broadway, Ste. 201, Lubbock, TX 79401 by March 5, 2019. 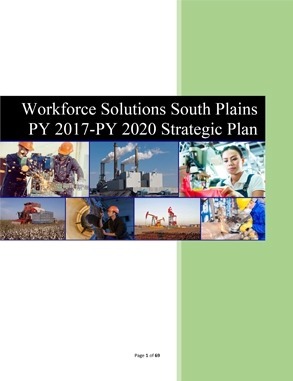 All comments will be incorporated as part of the Two-Year Plan Modification, which will be submitted to the Texas Workforce Commission.